With the continuous fight for gender equality in the past few years, the i3 delegates of Bangalore moved a step ahead in empowering young girls, preparing them for the challengers as they grow up to become women. As the theme of the week was announced to be ‘women empowerment’, the delegates went back with a lot of excitement and energy to empower every single woman possible. The theme being a vast arena to work on, each of the delegates worked on empowering women on various aspects. While some focused on women safety, physical and psychological changes as teenagers, the others focused on importance of education for girls, utilising technology and others. Impacting more than 500 women in a week's time, Monika, one of the delegates, also created waves on social media. Her blog about empowerment of women had more than 900 views in a matter of 2 days' time. “I reached out to 4 government schools, a couple of orphanages and girls in slums where I shared about a woman’s role in the society, making them feel proud of themselves. I also taught them to operate phones and computers. My brother also volunteered for the project. He helped many women get their aadhar card enrolled. A proof of identity is something that is very important in every citizen’s life and I really feel this would empower them as well” says Monika who also involved volunteers from other cities including Shimoga, Davanagere and Lakshadweep, who helped expand the execution. Naveen Kumar became the reason to empower more than 100+ school-going girls towards safety and better education. “It was quiet challenging when I had to address an all-girls class as a part of the women empowerment project. Initially, I felt hesitant to do this but the realization that empowering them would turn out to creating a far better society, pushed me to do this!” he mentions. 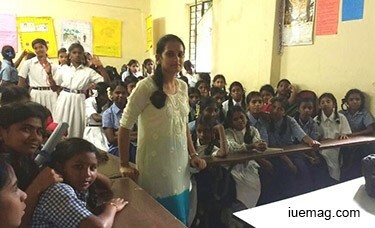 Meghana, a student of VIT Bangalore, was the reason to impact more than 303 girls in government schools where she created awareness about understanding one’s physical changes as a teenager and about keeping oneself hygienic during menstrual cycles. Powerful and most important lessons according to the age of the audience were Meghana’s focus. Altogether more than 3000 women were empowered as a part of the campaign, with the involvement of 20 delegates, who also led volunteers to execute the same. All in all, the word of mouth about the campaign grew exponentially. With the increase of such campaigns, the world is sure to see more powerful women leaders emerge. Creating positive thoughts at the early age is truly important as they carry forward the lessons while they grow. Any facts, figures or references stated here are made by the author & don't reflect the endorsement of iU at all times unless otherwise drafted by official staff at iU. This article was first published here on 15th October 2016.